Somehow, I managed to break one of the clips for the inner sun visor on my Schuberth S2 helmet (same visor for C3 and C3 Pro). Despite using duct tape to secure it, invariably it would come free and start flapping around whilst I’m in the middle of riding. Less than ideal. Today I finally got round to fitting my replacement sun visor. A little bit tricky as the pins on the hinges that go through the visor are slanted to ease the visor slotting in and prevent it coming out. I managed to gently push one pin from behind with a piece of wooden dowl, then prise the visor out. The visor having broken on the other side negated the need to repeat on the other pin. 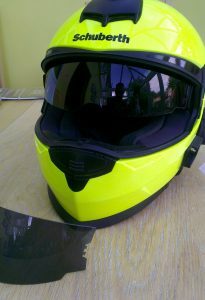 The replacement sun visor cost £35 from SportsBikeShop. Note it comes in two sizes for different helmet sizes.